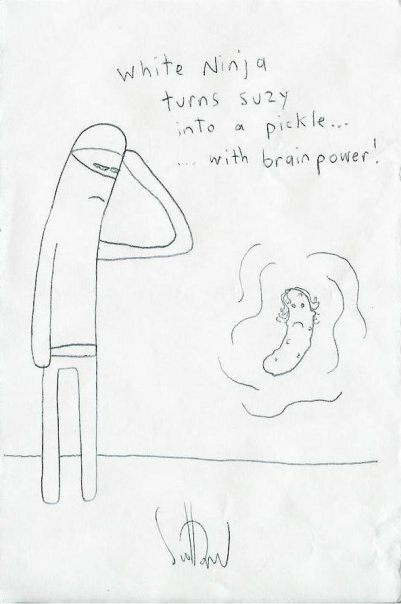 i had another pickle dream last night. you might be thinking, "another pickle dream? did i miss the post about the other pickle dream?" no. i just didn't think it was of any consequence. a pickle dream on its own is just that: a dream about a pickle. or many pickles. or two. but any time a dream is recurring, i think that means that it means more. i think that means that you need to examine it and analyze it and just turn it over and over in your head day and night. act it out in the daylight and see what is revealed. last night, i dreamt that all the pickles in my fridge were made out of tofu. last week, i dreamt that i tasted a pickle and wished it had more vinegar. could this mean that i need more vegetarians in my life? or less, maybe? but, aren't pickles already vegetarian food? why would you need for your pickles to be made out of tofu*? would tofu pickles be kosher?